Greetings friends and fellow crafters. LeeAnn here today in my guest spot with Dare 2 Be Artzy. I really have had a great time with these stamps and dies, and appreciate the opportunity to work with them. Today I used the Flip Flops stamp and die sets in my project. 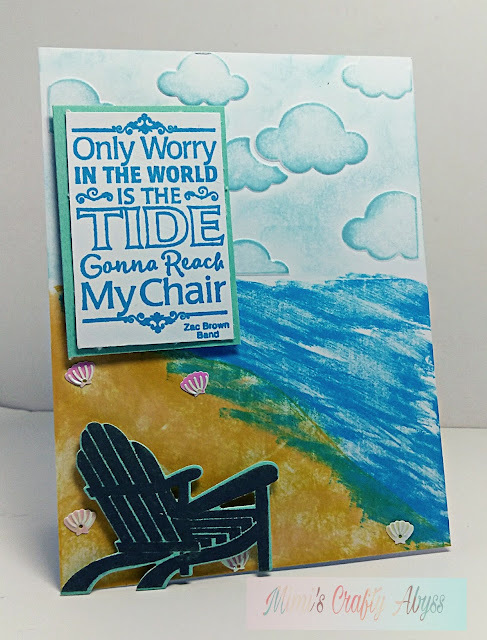 In order to make this project, I first ran the top half of my card topper through my Big Shot inside a Darice embossing folder to get the cloud feature. I stamped the chair on a piece of green cardstock and then rant it through the big shot as well using the die from the set. When this was complete I used Tumbled Glass distress ink to create the cloudy sky. I used Dried Marigold to create the beach sand look and Mermaid Lagoon to create the water. With a swiping back and forth motion I created it to appear there were white caps on the water as the tide was coming in. With a big of the water washing over the the shoreline. I used Bahama blue to stamp the sentiment and cut with my trimmer to size, adhered with foam tape. I hope you enjoyed today's project and I really think this needs to be a beach day. Thank you so much Kel, your words mean a lot. WE need to have lunch next time i am down there.